For young children, play is at the center of learning. It is through play that children develop a sense of curiosity and understanding about the world, other people and themselves. Play supports children in their social, emotional, physical, and intellectual development while simultaneously encouraging them to become creative, active participants in their own learning experience. At Little Hopes, Play Based Learning is at the heart of the curriculum. Using curriculum themes that are designed to build upon the unique needs, interests, and strengths of each child, children will gain a well-rounded education that will facilitate a life-long love and appreciation for learning. Children will not only initiate and direct their own play, but they will also participate in developmentally, age appropriate activities each day individually or in small or whole groups. The curriculum will be posted on the Parent Board for you to review, along with suggested extensions for learning that you can enjoy at home. 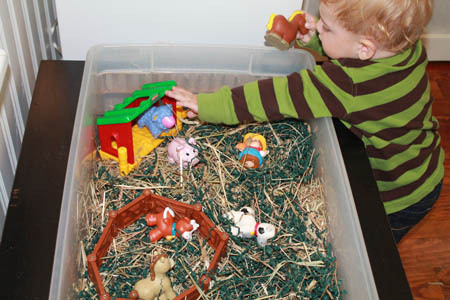 A Sensory Table Activity Helps Explore a Theme.